Nurse assistant Henriette Hansen is committed to her work with real time data in quality improvement. Interview with Henriette Hansen, who’s a nurse assistant at the nursing home ‘Skovcentret’ in Lolland municipality and committed to the project In safe hands. 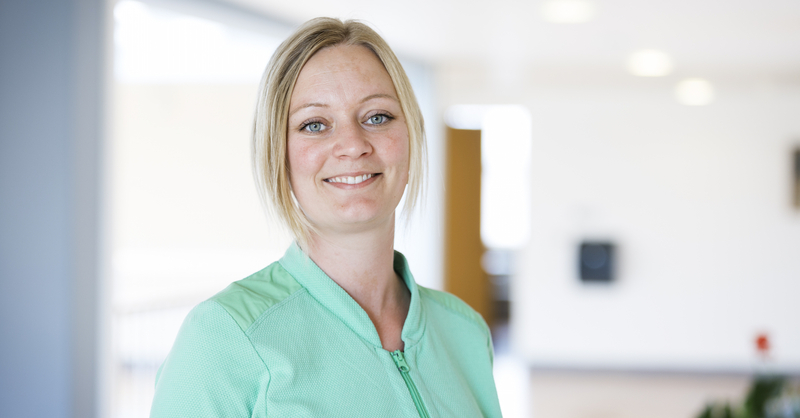 In safe hands has motivated the nurse assistant Henriette Hansen from the nursing home Skovcentret on Lolland to stay on working with care for the elderly. She is challenged daily by working with real-time data, and it’s important for her joy-in-work. It wasn’t the plan – ending up as a ‘data nerd’, but stubbornness has driven her to dive into and really understand how to work with real-time data. What has In safe hands meant for your professional competence? I’ve gotten so much insight into leadership, interdisciplinarity, structure and the use of data. If not for this project, I don’t know if I would have felt, that it was challenging enough to work with elderly care. Back when I was hired, it wasn’t what I actually wanted. I just wanted some experience, and then I wanted to move on to a hospital, because I thought that I would eventually study to be an RN. Now I don’t want to be anywhere else. I’m never bored, and I always have something to do. I like the contrast between care-giving and data work in the office. Sometimes I just feel the need to be hands on in care, and I still can do that. It’s a great combination. What’s so interesting about working with real-time data? Data appeals to me, because you can always keep an eye on, how you’re doing. It gives me a goal to work towards, and that motivates me. Today I guess I’m what you call a ‘data nerd’, but I hadn’t really seen it coming. I had never worked with data before I started working on In safe hands, so it was hard at first. I spent a lot of time diving into the numbers to try and understand them, and I was very stubborn. At home I have a printed photo of how I had paper with data all over my desk, the window frame and on the shelves. There was no way I could manage it. Every time I look at it, I remember how much I struggled. But when I finally managed to collect all that data, and get an understanding of how it all worked, it caught me. All the speculation we use to have of where our issues might be, suddenly became very clear. Now I can see – black on white – how many pressure ulcers and medication errors we have. And it gives me a whole new systematic way of working with improving the quality of care. I need to dive into the numbers and really understand them, even if it’s not necessary to understand it all. It’s been important to me, that every one of my coworkers get a monthly feedback on the areas, where we see improvement potential according to data. That’s my responsibility. At first, I was worried how they would feel, but they really appreciate it, and they’ve come to see how data can be a foundation for personal development as well. You teach colleagues from other municipalities in the use of real-time data. What’s that like? It’s really given me growth, being out teaching. I used to be pretty cautious and shy, so it was hard at first. But I did it anyway, because it was important to me to share my experience with others. I’m a lot better now at standing in front of a lot of people. I found out that it wasn’t as scary as I thought. And I feel more certain of myself, the more experience I have. I learn something new every time. Other people’s ideas inspire me, and when I apply them to some of our own challenges I suddenly see new solutions. I love that others can learn from the mistakes we made at first. Telling my own story now also means, that I won’t make the same mistakes we’ve made. And that matters, because it’s a part of sticking with the new routines and methods from In safe hands. Which we now use in many different contexts.